When one thinks of the most iconic images in cinema, what comes to mind might be an odd extra terrestrial flying over the moon in a bicycle. Or Humphrey Bogart giving up the one thing he loves on a misty tarmac. Or Janet Leigh meeting a particularly grisly end while taking a shower. “La Dolce Vita” is about both everything and nothing at the same time. In a close to three hour running time, it accomplishes so little, yet every second feels earned. While plot isn’t the film’s number one concern, there certainly is one. Marcello (Marcello Mastroianni) is a gossip writer who drives a tiny convertible on his constant life on the road. While he seems content with his on-the-go lifestyle, he often longs for a day when he can settle down. Yet, he is discontent with his suicidal but caring lover, Emma (Yvonne Furneaux). So, he embarks on affairs with the beautiful Maddelena (Anouk Aimee) and the free spirited Swedish-American actress Sylvia (Ekberg). It is during his affair with Sylvia that he goes from a chaotic life of his own rules, to a total indulgence in, well, the sweet life. Before this, the only other Fellini film I had viewed was “8 1/2.” That film is usually considered Fellini’s masterpiece. It was mesmerizing for around 90 minutes, and then it just went nowhere fast. “La Dolce Vita” is very similar to “8 1/2″ in that it contains a wandering narrative. Yet, this narrative seems more grounded in reality, and makes an even more interesting point about life. Fellini’s point seems to be capturing life itself. There are so many strange yet fascinating rituals and events captured. Besides the waltz in Trevi Fountain, there are other great sights such as the pilgrimage to the site of the Virgin Mary and the circus acts that take place inside a lively nightclub. Random occurrences like these are not sidesteps away from the actual story, but rather things that make the story even better. There are moments in “La Dolce Vita” where everything is glaringly self-aware. It knows that in the end, it is a film. It doesn’t do this through winks, but merely by experiencing what is on screen. It might make you jitter a little bit to see an Italian Neorealist film that mentions Neorealism in it, or to see the giant lights set up from a film crew, probably facing the actual crew of the film. Fellini is one of those directors that’s so great simply because he understands how to work a camera and put a film together. He knows how one little object, or one little beat, can have a ripple effect and change the entire course of a film. Once again, take a look at the Trevi Fountain scene. It is not just the visual that you won’t forget, but the those soft plucks of the harp. It all amounts to an underlying beauty and perfection. The power of the gods flows through the waters and transforms Sylvia into a goddess figure with a hypnotic nature. The title “La Dolce Vita” carries both bitter ironies and bitter truths. Marcello lives both everyone’s dream, and everyone’s nightmare. He feels he can do whatever he pleases, because he has no one to tell him otherwise. It is not so much traveling he is addicted to but isolation. That’s what makes his story all the more haunting. The rest of the characters are as fascinating as the locations. The rest of the cast is constantly changing, yet each is presented well enough that their quirks and personalities are fully understood. Each one seem to become a part of Marcello’s collective consciousness. Throughout the film, many comment that he has no heart. He is more like a blank slate, collecting ideas and pieces of personality through all of the people he encounters. I don’t want to give away the ending of the film, only briefly discuss it. Though I wouldn’t be giving away the end of a story, but the end of a character development. Let’s just say it ends at an odd moment, one that feels a little like “The Old Man and the Sea.” The rest of the conclusion is told through gusts of wind and crashing waves. Like Hemingway, Fellini can tell a story and bring to the surface all of his themes through a few simple, yet extremely meaningful images. The emotions that are never stated, yet are so palpable, in the conclusion will not leave you once the credits roll. 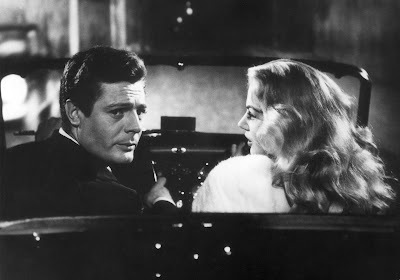 “La Dolce Vita” is not just a film lover’s film, but film in its purest form. Through the lavish dance numbers, parties, and debauchery, a point emerges. Fellini seems less interested in capturing a story than he is in capturing the beauty of the moving image. This entry was posted in Anita Eckberg, Federico Fellini, Great Scenes, Italian, La Dolce Vita, Marcello Mastroianni, Movie Review, Neorealism, Trevi Fountain on June 8, 2010 by ian0592. Not yet but I’ve actually had it on my shelf since I was 13 and keep forgetting to watch. Now I think I’m a little more encouraged to finally do so.